Garbed in a torn-up coat, Raph heads toward Chicago within the boxcar of a freight train. He recalls earlier, when he and his brothers were watching TV. A report about the recent, mysterious destruction of the Whelan-Freas Scientific Research Center in Chicago carried with it a chilling photograph: Complete Carnage. Hare-trigger as usual, Raph raced off to Chicago to pick a fight with their old foe against Leo’s advisement. As the train enters the Windy City and travels over an el, the entire structure suddenly collapses and sends Raph reeling through the roof of an abandoned building below. Recovering, he’s greeted by the freakish super humans: Rock, Beast Boy, Shrew and Widow. Following their argument with Raph, the other Turtles headed to the Natural History Museum to have a word with Carnage’s old nemesis and their old friend, Dr. Raven Shadow Heart, AKA Radical. 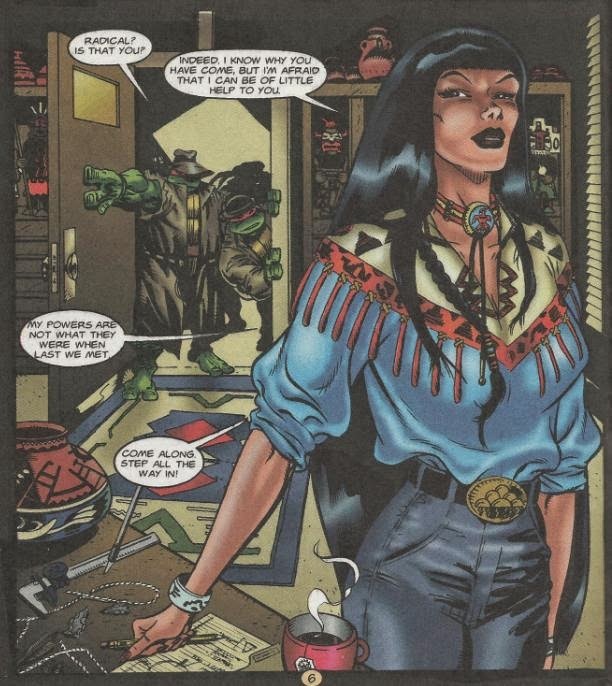 Radical greets them and whisks the Turtles away to the Dreamscape where she has some terrible news to impart. The mystic Council who gave her her powers have decided that she is now only permitted to use them within the Dreamscape, thus making it impossible for her to battle Carnage in the waking world. She also reveals that the Carnage that attacked Chicago is not the “real” Carnage, but a clone created by scientists from a limb Radical tore off of him in one of their earlier New York battles. Though she cannot fight alongside them, Radical decides to teleport the Turtles to Chicago, even if it might displease the Council. Back in Chicago, Raph is being pounded by the super freaks. He holds his own until Officer Dragon arrives and cools the situation down. Raph explains the Complete Carnage situation to him and Dragon agrees to help, though the other super humans refuse assistance and march off into the shadows. Complete Carnage finds Raph and Dragon first, however, and attacks. The Carnage clone appears to be bigger, uglier, more mindless and more powerful than the original, standing up to even the Dragon’s best punches. Raph warns Dragon to keep Carnage away from any manmade materials, as they give him strength, but in a city like Chicago, that’s sort of a tall order. As Carnage gets the upper hand, the other Turtles finally arrive and tackle their foe. Dragon unloads a haymaker and sends Carnage reeling through the brick wall of a nearby building. Dragon believes his punch knocked the villain out, only for Carnage to send the building toppling over toward the five heroes. 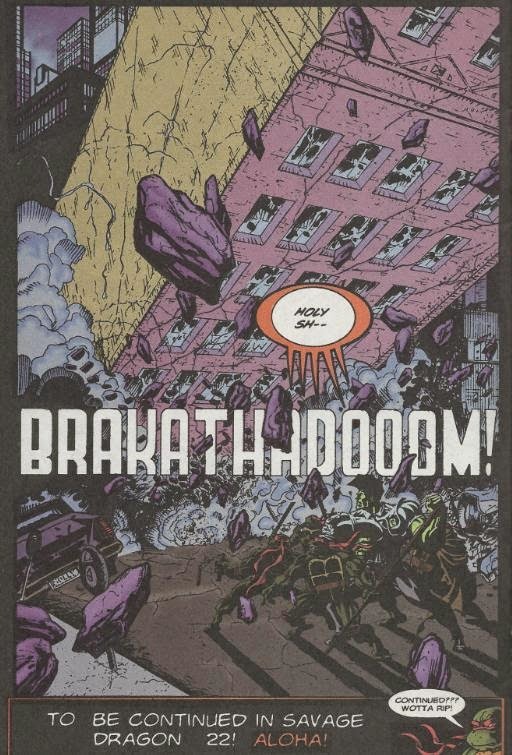 *This story will continue in The Savage Dragon #22. *The Turtles last encountered Complete Carnage and Radical in TMNT (Vol. 1) #27. *Radical had previously torn off Carnage’s arm in Tales of the TMNT (Vol. 1) #5. 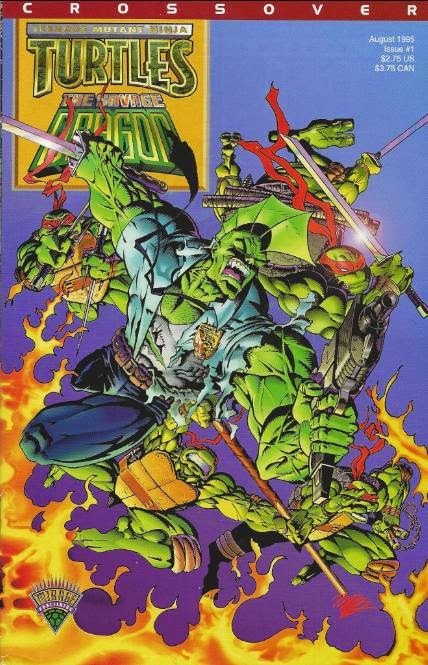 *The Turtles last met Dragon in The Savage Dragon/TMNT #1. 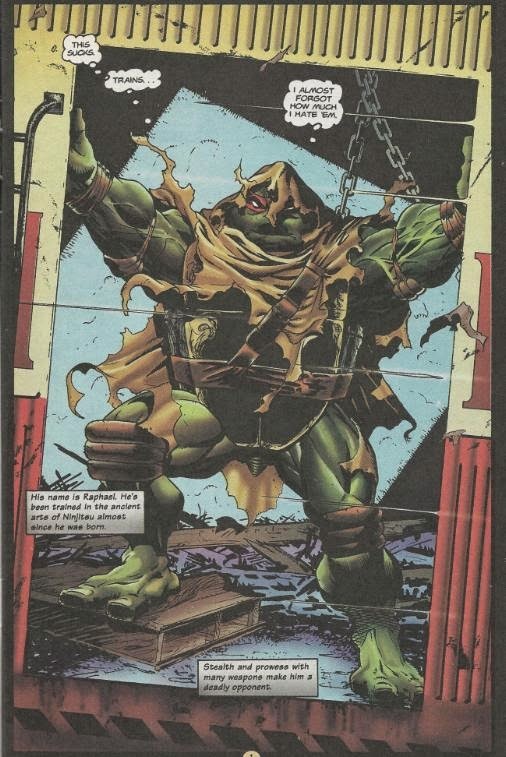 *Radical will appear next in TMNT (Vol. 4) #4. A much more satisfying start than the previous TMNT/Savage Dragon crossover, this one has far more substance to it. I was never sure what to think of Complete Carnage and Radical. They were sort of just there in the Mirage comics and while I didn’t mind them very much, I never felt particularly strongly about them (though I did find it perplexing that they were never used in the 4Kids cartoon). Regardless of that, it was cool to see their plot threads resurface for this crossover and give it the sort of story weight that the previous arc lacked. If there’s one downside to this issue from a story-telling standpoint, it’s that Raph’s fight with the freaks was sort of a waste of time. They don’t participate in the main conflict and are just there for a meaningless brawl. I don’t really read Savage Dragon comics, so I honestly can’t say if they’re important supporting cast members in his book or not, but I found them all to be very dull. The issue would’ve been better off with the page space used for their fight being used for the Complete Carnage battle, or maybe just more banter between the Turtles and Radical. Anything other than what we got. Dooney’s art is as terrific as ever. 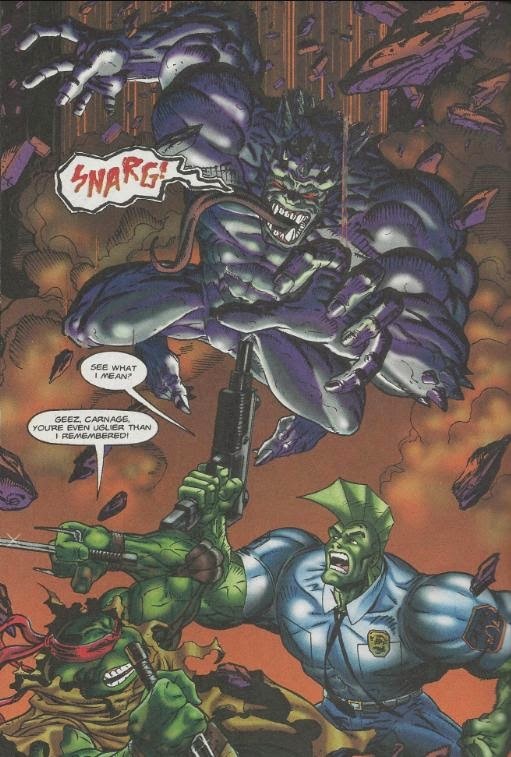 While he drew Dragon scrawnier than usual in the last crossover, here he gets the Liefeldian proportions right, as the Dragon appears as grotesquely muscular as he’s supposed to. Whether that’s a good or bad thing is entirely up to you. The Turtles look great, Carnage is suitably monstrous and the action is well-staged. In other words, an excellent Dooney issue. One problem I had, and I don’t know if it’s consistent across all versions of this issue, is that the pages in mine are all mixed up. They’re numbered in order, but the narrative is all out of whack and a two-page spread is cut in two and placed on the opposite sides of one page rather than across two adjoining pages like it’s supposed to be. I had to go back and look over the pages to realize what order I should be reading the scene in (14, 20, 21, 22, 19, 23 is the proper order; 15 through 18 is dedicated to a cheesecake pin-up of the She-Dragon). A shame, since it’s during the Complete Carnage fight, which is the real meat of the issue. Bummer. Overall, a more amusing crossover than the previous one and it isn’t over yet.